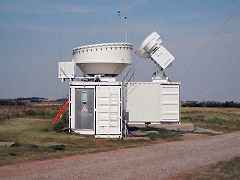 The Ka-band ARM zenith radar (KAZR) is a zenith-pointing Doppler cloud radar operating at approximately 35 GHz. The KAZR is an evolutionary follow-on radar to ARM’s widely successful millimeter-wavelength cloud radar (MMCR). The main purpose of the KAZR is to provide vertical profiles of clouds by measuring the first three Doppler moments: reflectivity, radial Doppler velocity, and spectra width. At the sites where the dual-polarization measurements are made, the Doppler moments for the cross-polarization channel are also available. In addition to the moments, velocity spectra are also continuously recorded for each range gate. The Transmitter uses a Traveling Wave Tube amplifier. The antenna type is a Cassegrain parabolic reflector with a diameter of either 3 m or 2 m.